Can Humans Melt the Antarctic Icecap? Can we puny humans produce enough energy to melt the icecaps? When discussing climate with people who do not have technical backgrounds, I have learned much of the climate discussion is a foreign language to them. Phrases like “Dalton minimum” or “Atlantic multidecadal oscillation” make their eyes glaze over. Once, after I explained what causes wind, the reply was, “my head hurts.” So, I no longer try to explain atmospheric science. Besides, I am an engineer, not a meteorologist. I have had better luck by sharing simple examples that let people reach conclusions on their own about human versus natural influence. Telling them I can show them the math if they want to see it adds credibility, because few, if any, alarmist publications intended for the general public include any math to support their claims. Describing the energies that drive weather, and therefore climate, is a good way to do this. So, I take them through a few examples of how much energy is involved and how miniscule human activity is by comparison. Done properly, this lets a non-STEM person grasp the huge amounts of energy involved. Another excellent example is the amount of energy in an average hurricane. According to NOAA-OAR-AOML, an average hurricane releases 200 times the world’s electrical energy production just to produce the clouds and rain. There are about 70-100 tropical cyclones per year worldwide. Seventy storms would average 14,000 times the world electricity production every year. These types of examples are good for communicating with nontechnical people. They let people relate atmospheric physics to their own life experience and everyday understanding of the world in which they live — even if that understanding might be skewed or incomplete. And then there’s the ice. We are supposedly melting the ice; the literature is filled with papers making this claim. These papers invariably whine about human activity warming the planet, but they never seem to get around to discussing how much energy is actually required, or how it gets to the ice. But do humans really generate enough energy to melt significant amounts of ice? In a remote region of Antarctica known as Pine Island Bay, 2,500 miles from the tip of South America, two glaciers hold human civilization hostage. Stretching across a frozen plain more than 150 miles long, these glaciers, named Pine Island and Thwaites, have marched steadily for millennia toward the Amundsen Sea, part of the vast Southern Ocean. Further [sic] inland, the glaciers widen into a two-mile-thick reserve of ice covering an area the size of Texas. There’s no doubt this ice will melt as the world warms. The vital question is when. …Antarctica is a giant landmass—about half the size of Africa—and the ice that covers it averages more than a mile thick. Before human burning of fossil fuels triggered global warming, the continent’s ice was in relative balance: The snows in the interior of the continent roughly matched the icebergs that broke away from glaciers at its edges. Now, as carbon dioxide traps more heat in the atmosphere and warms the planet, the scales have tipped. All this could play out in a mere 20 to 50 years—much too quickly for humanity to adapt. …There’s a recurring theme throughout these scientists’ findings in Antarctica: What we do now will determine how quickly Pine Island and Thwaites collapse. A fast transition away from fossil fuels in the next few decades could be enough to put off rapid sea-level rise for centuries. That’s a decision worth countless trillions of dollars and millions of lives. Now, 11 feet [3.353 meters] of sea level rise is a lot of water, which means a lot of melted ice. How much ice? And how much energy is needed to melt it? We can use some high school physics in a Fermi analysis to establish a benchmark of sorts that nontechnical people can understand. To do this, we need to agree on some basic numbers and then use them to examine the situation in Antarctica. This assumes the ice is at standard temperature and pressure (STP — essentially air pressure at mean sea level and temperature at 32°F/0°C). More on that later. First, let’s examine some basic volume and mass definitions. Some values are rounded. 1 liter of water has a mass of 1 kg, by definition. Freeze it and the volume increases. 1 kg ice is 1.09 liters, or 0.92 kg/liter. One cubic km = 1012 liters. So 1 km3 of ice = 9.2×1011 kg. This is our basic unit of mass for melting the ice. A generally accepted value for the total ocean area is 3.618 x 108 km2. Raising this surface by 1 mm requires 361.8 Km3 of additional water. Raising the ocean by 3.353 meters requires 361.8 Km3 X 3353 mm = 1.21X106 Km3 of liquid water, which comes from 1.32X106 Km3 of glacial ice. How much energy is needed to melt 1.32X106 Km3 of ice? The question is important because, regardless of ice thickness, whether it is on land or is a shelf, wave action, collapse due to instability, or temperature gradients, there is a specific amount of heat energy that must transfer into any mass of ice before it can melt. This is basic physics, and it holds regardless of how the heat transfers (e.g., advection, conduction, etc.). The only debate, then, is how much of that heat comes from human activity versus natural forces, and how did human activity cause its portion of the heat to arrive at the ice? And if Holthaus’s article is correct, the ice will melt in 20 to 50 years. This gives us a rate of heat transfer, and that can give us insight into how credible it is to blame human activity. It takes 333.55X103 J to melt 1 kg of ice. Doing the math, we see it takes 3.07X1017 J to melt a cubic km of ice. This is our basic unit of heat energy for melting any large amount of ice in Antarctica, or anywhere else. Now, back to the two glaciers. We have determined how much ice is involved in that 11-foot ocean rise: 1.32X106 Km3. To melt it, the ice must receive 1.32X106 Km3 X 3.07X1017 J, or 4.05X1023 J. This is true regardless of what process gets the heat to Antarctica. A steady melt would require 2.03X1022 J per year to melt it in 20 years, or 8.1X1021 J per year to melt it in 50 years. We can argue until the cows come home about how that much heat can reach the glaciers. But for our nontechnical friends, it’s interesting to compare the energy requirement with how much energy humans produce. In other words, if humans set out to deliberately melt the Thwaites and Pine Island Glaciers, could they even do it? 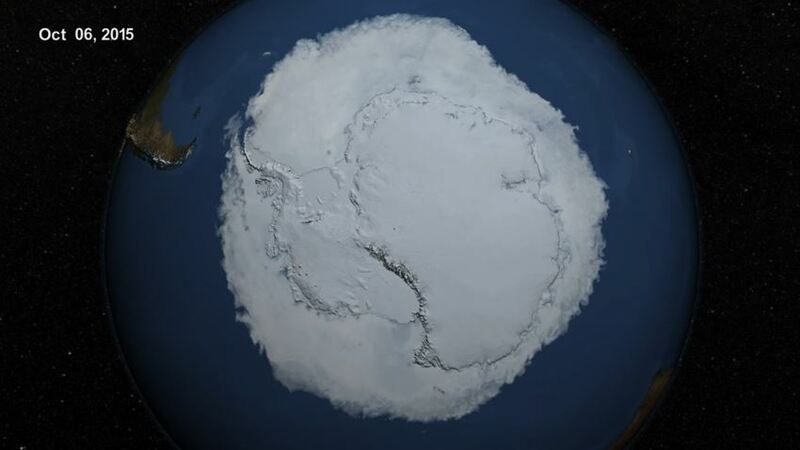 It should be noted the Antarctic ice sheet is only 2.74 percent of the planet’s surface. If human output excites the atmosphere evenly, a reasonable consideration is only that percentage of energy is directly acting on the ice. But let’s attack the problem more directly. 4.05X1023 J ÷ 8.906X1019 J = 4,547.5 years. That’s just to melt two glaciers. What would it take to melt all of Antarctica? Per the National Snow and Ice Data Center (NSIDC), Antarctica contains about 30 million km3 of ice. So, for Antarctica, we need 3.07X1017 J X 30X106 km3 = 9.21X1024 J to melt everything. How many years would it take? 9.21X1024 J ÷ 8.906×1019 J/year = 103,413.43 years. When talking to your non-STEM friends, just round it off to 100,000 years. This number, and Anthony’s Hiroshima analysis, makes me think human influence on the weather, and therefore climate, is so miniscule it cannot be measured with existing technology. Obviously, it is not possible to apply 100% of our energy to melt the ice. We would be limited to a much smaller amount, with correspondingly longer times to melt. The ice will try to re-freeze. This causes a feedback loop, extending the melting program. We can only prevent this by keeping water and air temperatures in contact with the ice above freezing. That diverts energy from doing the melting. I know, I know. This is a very simplistic analysis that ignores the complexities of actual heat transfer. But that’s the point; non-STEM people can follow it if they know a little math. And yes, the alarmists would argue human emissions are indirectly causing heat to transfer to Antarctica, and this type of analysis is therefore irrelevant. So what? They must show how human emissions transfer that heat, and how much heat is being transferred. My goal here is to show the enormous energy levels involved and how ridiculous it is to blame humans for any significant ice melt. That’s my hypothesis; let the alarmists come up with the null. Now let’s build some power stations and melt Antarctica! H/T to Grady Gillis for sharing some ideas, and especially for saving me from a very basic unit conversion error. Julius Sanks is an engineer and manager with experience developing weather forecasting systems and environmental satellites.